After the war [WWI], Alice Roosevelt Longworth would evolve into a Washington statesman. Not limited by a constituency as were elected politicians, she could go anywhere, talk with anyone. Her power came to be greater than any lobbyist’s or social maven because her home was the place to be, to see and be seen, to spill secrets, to meet people, and to broker deals that could not be made in Congress. Alice’s drawing room became a required stop on the path to political prominence.” Stacey A. Cordery, Alice: Alice Roosevelt Longworth, from White House Princess to Washington Power Broker. Still an interesting read, as Alice’s life takes some pretty amazing twists and turns. Acerbic, witty, a fine hostess, and yet not infallible. Interested in politics until her dying days — and the story is fascinating enough that someone like me (who hates current politics and political ads) could find the rise and fall of different politicians as Alice shows that she never quite got over being a wild child. It was interesting to see how Alice evolved into someone who talked to anyone (Nixon, the Robert Kennedy and JFK, Truman), or who could stridently campaign against a relative (FDR), but still let her only daughter play with his children in the White House. Honestly, she wouldn’t have been easy to live with, but she would never have been boring. So now, for balance, I suppose I should find a good biography of Eleanor Roosevelt. 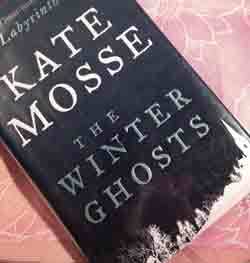 Kate Mosse’s book, The Winter Ghosts, is a short read (about 260 pages) — Half ghost story and half historical fiction. I finished it in one day, pausing to knit a row or two on my current project when I got too nervous that things might go badly for the main character, Freddie. The progression from half-heard sentences (or omens) to full discovery, and the protagonist turning his shattering grief from WWI into something with purpose… is handled quite well in this elegant little story. It didn’t suffer from being read on a warm September afternoon. 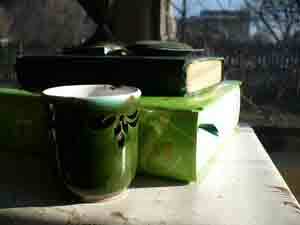 But low lamplight during a blizzard would add to the chill of reading ghostly words. The Glass Room by Simon Mawer provides a story of WWII that is difficult to forget. The image of a house built to enclose space is haunting — its inhabitants walk into the unease of WWII and then are enclosed by the events of history. Liesel’s story, and the multiple romantic entanglements between her, her husband Viktor, and their extended group of friends manages to give a view of lives that are messy and interesting, and not so heroic as to be unbelievable. And through it all, the house remains as stolen property, like the lives that were stolen from the protagonists. Things got so messy in the novel, I worried there wouldn’t a close to the book that would leave me satisfied, without it feeling false. I’ll let you read to see how Liesel and Viktor’s story finishes in a tangential way. Since the house itself was a real one, even though the lives in the novel are very fictionalized, you can walk through the house’s sun-drenched rooms if you visit Czechoslovakia. There’s an article from 2012 here, with some photos of the space. Definitely a modernist aesthetic — and interesting that the house remained through it all and has been restored.